This is a delicious appetizer. You can omit the fruits and add boiled seafood of your choice. This recipe was first published in Flavours magazine. Soak the cubed pineapple, apples, mango, rose apple and guava in lightly salted water for 10 minutes, then remove and drain. Pound the bird’s eye chillies and garlic, with a mortar and pestle, till fine. Add in the palm sugar, fish sauce, lime and tamarind juice and stir till well mixed. Place all ingredients in a bowl. Stir gently till well mixed. Cut the durian into long, thin strips. Mix the durian, tapioca flour and salt together, making sumall stainless steel bowls. Place anre the durian strips are well coated. Arrange the durian strips in thin layers in sother stainless steel bowl over the strips, sandwiching the durian strips inside. Heat the oil over medium heat. Place the bowls gently in the oil and fry till the baskets are crisp and golden. Remove from the oil, allow to cool and carefully remove the durian baskets from the bowls. Set aside to cool completely, on paper towels. 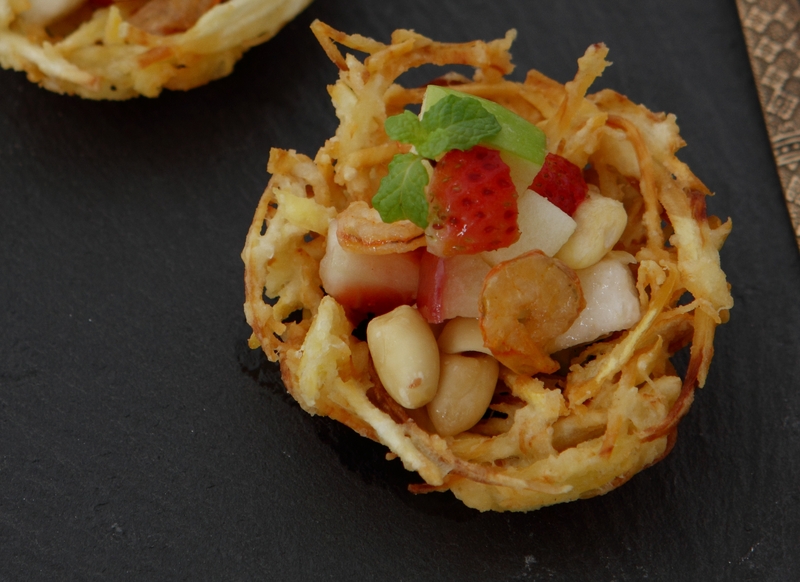 Spoon some fruit salad into the durian baskets and serve immediately. Notes: You can omit or add fruits according to your preference; you can also add some boiled seafood of your choice. Tried this with crab salad and my guest loved it. A friendly tip- I did some under the cooking time just to see if I liked the bitter sweet taste and avoid it!! It lost its crispy texture and made my house smell like it!